And we have learned a lot about ways in which you can help prevent this disease. Vision Imaging, medical imaging service in Kingston, offers ways in which you can decrease your risk for breast cancer. Every single day at Vision Imaging of Kingston, we give people x-rays, we look at x-rays, and we make a diagnosis based on them. While we don’t spend a ton of time thinking about them as anything more than medical imaging equipment, x-ray machines have come a very long way since the x-ray was first introduced. In fact, x-rays have a very interesting history. Want to know a little bit more before you come in for your next x-ray at Vision Imaging. While this may seem a bit crazy, x-rays have been used as a form of diagnostic imaging for over one hundred years. In fact, in 1895, Wilhelm Roentgen discovered how x-rays could be used and spend the next few decades perfecting the science. Lucky for us, x-rays are still widely used today. Obviously, the technology used to make x-rays a reality has progressed immensely over recent decades. So much so that DEXA scans, CT scans, and bone density scans all use x-rays in order to work properly. In fact, these days x-rays use only a small fraction of the energy they used when they were first invented. Not to mention, you will get your x-ray images back much more quickly now than you would have even twenty years ago. While human did learn how they could perform x-rays in 1895, this medical imaging procedure has been a major part of nature for centuries. Background radiation occurs on the Earth naturally as the planet picks up x-rays that are flying through space. Sure, x-rays are mostly absorbed through our atmosphere but they are also constantly being produced by celestial objects like supernovae, accretion disks of black holes and pulsars. All of these waves give scientists the ability to learn more about the universe as well as make images of the cosmos. This might seem like a strange fact to include but we think it is absolutely fascinating that x-ray technology can be used more than just in the medical world. When art historians want to know if there was something painted on a canvas before the final work of art, they can use x-rays to determine that. While x-rays are most commonly associated with viewing bones and various human tissues, you may not be aware that x-ray technology actually played a big role in unlocking the secrets of DNA in the human body. By using a process known as x-ray diffraction, scientists were able to begin giving people much more information about their genetic makeup than they were ever able to before. Need an X-Ray in Kingston? If you are in need of an x-ray and you are not sure where to go, we would suggest that you visit us at Vision Imaging of Kingston. We can provide you with everything you need in terms of medical imaging. Call us right now to make an appointment. Last month, we gave you information about National Osteoporosis Awareness Month and how you can stay informed about your bone density as you age. 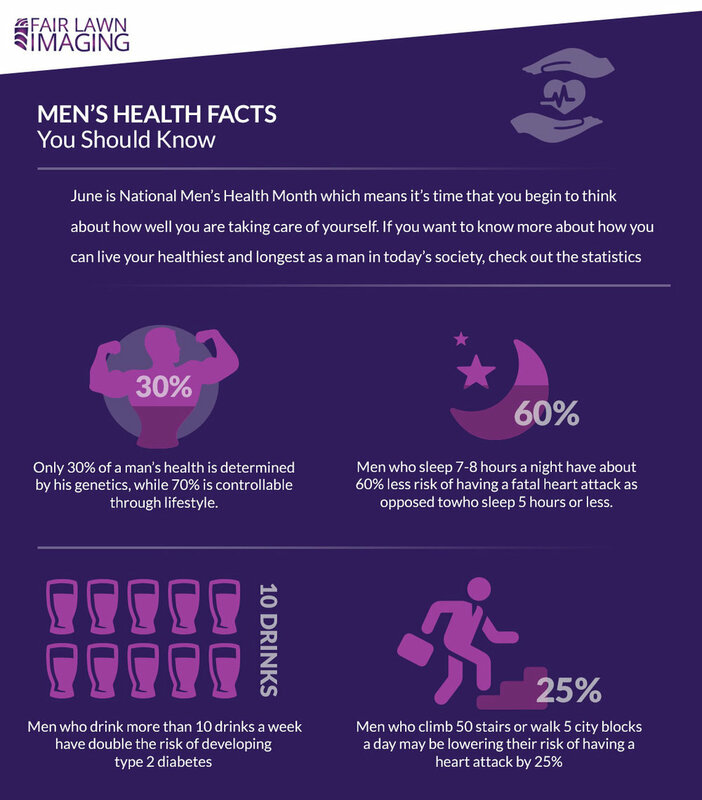 However, now we have moved onto June and this is the month that is meant to focus on men’s health as a whole. This is the month when medical professionals suggest that men learn more about the importance of screening for diseases that typically affect males. In this post, we are going to speak more on which sorts of diseases men should be worried about the most, and how they can take steps to prevent them this month and for months to come. Continue reading below to learn more. What Sorts of Diseases Should Men be Screening For? Among the most common diseases that affect men, are likely the ones you hear about most when you are flipping through the channels on your television. But just to clarify, let’s list them off. This serious condition is an enlargement of the aorta, which is the main blood vessel in your body that delivers blood from one area to another. When you are at risk of developing an Abdominal aortic aneurysm, there may be absolutely no signs ahead of time. This is why screenings are so incredibly important. By having a simple and quick ultrasound, your doctor can determine if an aneurysm exists and whether or not it is growing. When discovered, your doctor will choose whether or not it should be monitored moving forward or if surgery is required. While this condition is not fatal, it certainly can cause an overall decrease in your quality of life. Benign Prostatic Hyperplasia is simply an enlargement of the prostate gland that makes urinating extremely difficult. This condition is not thought to be a precursor to prostate cancer, but it can lead to a number of health problems such as infection, bladder stones, and overall reduced kidney function. Depending on the severity of a person’s condition, a physician may suggest medications that will relax the bladder or shrink the prostate. Surgery is also an option in more severe cases. If you can’t remember the last time you saw a physician or had a screening, it’s time to take some initiative this month. Contact Vision Imaging of Kingston today and find out if we can make you an appointment for a screening sometime soon. We would be happy to help you. You may not have been aware previously but May is the month that is dedicated to raising awareness about osteoporosis. Chances are if you don’t know what osteoporosis is, you also didn’t know that there was a month dedicated to making sure people know about it. So let’s start with the basics. Osteoporosis is a silent and progressive disease that is characterized by decreased bone density and the increase of bone fragility. Most commonly, this disease will affect people as they age, with women being more commonly diagnosed than men. In this post, we are going to give you some more information about osteoporosis and what you can do to fight the causes of it. Continue reading below to learn more. As we mentioned above, osteoporosis is much more common in women than it is in men. In fact, nearly 80 percent of all cases of this disease occur in women. This is one of the reasons why teenage and developing women are often encouraged by their doctors to build strong bones through eating well and exercising. The more preventative actions they take as they grow, the less likely they will be to develop osteoporosis later in life. While it might be hard for young women to understand the importance of these actions now, having weak bones later on can be extremely debilitating and greatly lower the overall quality of a person’s life. It is more common than not that osteoporosis may progress silently for decades before it is detected. In fact, this disease could be developing over time and a person wouldn’t experience so much as a fracture in that time. However, once the same person reaches middle age, it may be too late to prevent the symptoms that will soon signify they are suffering from osteoporosis. If you find that you have had a number of fractures in a short amount of time, however, we would suggest that you speak with your doctor as soon as you possibly can to learn if osteoporosis is what is ailing you. In the case that you do think you are experiencing bone loss, your doctor will likely suggest that you have a bone densitometry, or DEXA scan. This is a simple screening that can help your physician to accurately diagnose osteoporosis. They do this by scanning your bones and measuring their density. This scan can also indicate to your doctor whether or not you need to consider the possibility that you will have osteoporosis in the future. DEXA scans have been shown to be an extremely effective and valuable clinical tool for assessing patients who show possible signs of having osteoporosis and should definitely be something you consider if you are concerned about losing bone density over time. Are You In Need of a DEXA Scan? If you think you may need to learn more about the current state of your bones, we would encourage you to make an appointment at Vision Imaging of Kingston. We offer DEXA scans and can give you a better idea of whether or not you are at risk of developing osteoporosis in the coming years. Call us now for more information! We love bustin' some moves for Breast Cancer Awareness Month! Our 2016 3rd Annual Dancercise was so much fun...and good exercise! Once a year, Vision Imaging and friends get together at Candy's Place for Breast Cancer Awareness month to bring the women's breast cancer community together. Remember to support your local wellness center. We hope you can make the next one in 2017! You don't have to be a perfect dancer...you just have to be dancing! It’s a One-Hour Dance / Work-Out Class that will have you dancing, laughing, sweating and supporting Breast Cancer Awareness like never before! The instructor will take us Dancing through the Decades in an easy-to-follow, fun class where you will break a sweat by shaking your groove thing to your favorite classics & todays hits! Wednesday October 26th 6:30PM – 8:30PM. Class starts @ 7PM, followed by a Mini Celebration that includes Raffle Prizes, Gift Bags, Cocktails, Apps & More! To show support for Breast Cancer Awareness Month and your local cancer wellness center, Candy’s Place. A $5.00 Donation will be collected at the door. Thank you for supporting Breast Cancer Awareness! We will dance with you soon! Vision Imaging of Kingston is fully accredited by the ACR in Computed Tomography, Magnetic Resonance Imaging, Nuclear Medicine, PET/CT, Mammography, Ultrasound and Breast Ultrasound. Image quality and procedure evaluations are conducted by board-certified radiologists & medical physicists who are experts in the field.